The International Speech Contest 2016 is On! Every year, 30.000 Toastmasters in 135 countries compete for the title of World Champion of Public Speaking. After winning their club and area contests, the Division contest on Saturday 23 April in Lille will determine who will represent our Division at the District 59 Spring Contest in Luxembourg, on 20-22 May in Luxembourg. The International Speech Contest culminates in the semi-finals and finals of the World Championship of Public Speaking at the Toastmasters International 2016 Convention, to be held on 17-20 August in Washington, D.C.
Judging criteria include speech content, originality, organisation, gestures, style and timing. 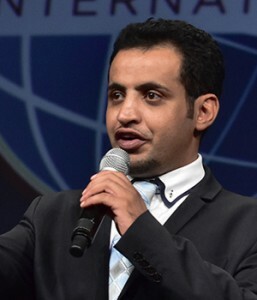 Watch Mohammed Qahtani’s winning speech from the 2015 World Championship of Public Speaking.